Shoe trees are a device that you put inside your men’s or women’s shoes to help retain its shape. People usually buy shoe trees for leather or expensive shoes that may wrinkle or lose their shape over time. However, you can also get custom trees for sneakers, if you’re a fan of keeping your gym shoes in the best condition at all times. The most common material is cedar wood, but some also hit the market with plastic and steel as well. There are no “standard” shoe trees in the market anymore. 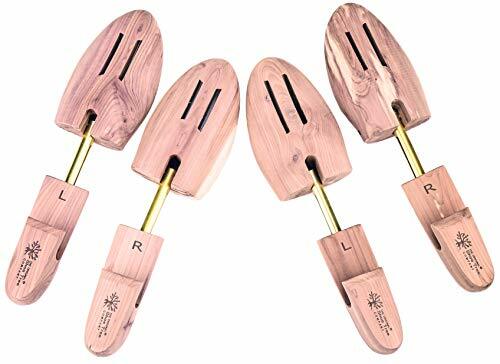 If your shoes are losing their shape, wrinkling, or you want to stretch them to fit you a little better, then you are going to need shoe trees. Owning a set or two can be the difference between your shoes wearing out prematurely, and them lasting for many years. If you are interested in learning more about these footwear accessories or getting a pair for yourself, then read on. You might find that once you have them, you’ll never want to be without them. When you fork out a lot of money for a pair of shoes, you may as well spend a little more and get these shoe trees. After all, failure to care for your shoes as best as you can means they succumb to the elements far quicker than you would like. One of the best shoe trees to offer longevity is a pair from Stratton. You can buy sets of two or three, which means you have enough for two or three pairs of shoes. Once you select your quantity, you can then pick from one of six sizes to fit your boots correctly. Then, get ready to experience exceptional quality. 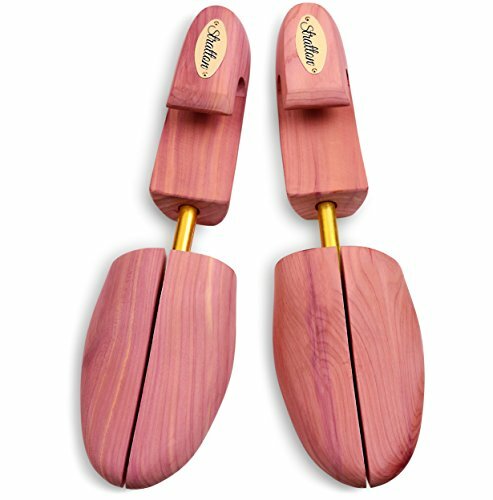 These cedar shoe trees are a brilliant accompaniment to any pair of shoes. They have an adjustable design, a beautiful cedar aroma, and they will absorb moisture and sweat naturally while leaving behind a lovely smell. That’s not all they can offer either. With an integrated spring coil centerpiece and light tension control, you never have to worry about wrinkles or your shoes losing their shape. You can buy these shoe trees for yourself or as a gift, for they are well-presented and elegant in every way possible. You will not regret purchasing these trees from Stratton. These shoe trees are not the best on the market, but if you need a quality pair at an affordable price, there are a million and one reasons why they may still be your first choice. Firstly, we’ll focus on why they may not be. The Original Shoe Tree Company used to provide high-quality, breathable nylon shoe bags to put your shoes in. Now, when you buy shoe trees, they come in cheap plastic bags that are not breathable. That’s a sticking point for many people. The second annoyance is the sizing may not be accurate, and there is no hinge mechanism to expand the toe section. Fortunately, those are the only reasons why you may look at other brands. Otherwise, there are more than enough reasons why they could be the ones for you. You get to choose from four sizes, enjoy the cedar odor, and revel in the convenience from the removal hook, glide adjustable spring, and double vents. These shoe trees also have laser etching, left and right labels, and a smooth and well-sanded finish. The heel is also sturdy, and it takes minimal effort to put these in your shoes then take them out again. Don’t be afraid to give them a try and see if they’re for you. If you prefer the convenience of an affordable price tag over something lasting for a lifetime, then there’s every reason to consider buying these shoe trees from B&E Life. Even though they won’t last very long, you get five pairs for an exceptionally affordable price tag. Often, that’s more of a lure than worrying about how long they last. You can buy them for men and women in black, yellow, and dark green, and enjoy how suitable they are for a full range of shoes. However, they are not overly practical for full footwear such as boots. Each of the five pairs in the set features hard plastic and steel and are entirely adjustable. They are also lightweight, take up minimal room in luggage, and come with a free shoe horn as well. It’s clear to see the manufacturing process is low cost, however. The plastic is sharp, can get brittle over time, and will break with only a few uses in many cases. You have to weigh up whether it’s worth spending more to get longer-lasting shoe trees, or spending less and winging it. 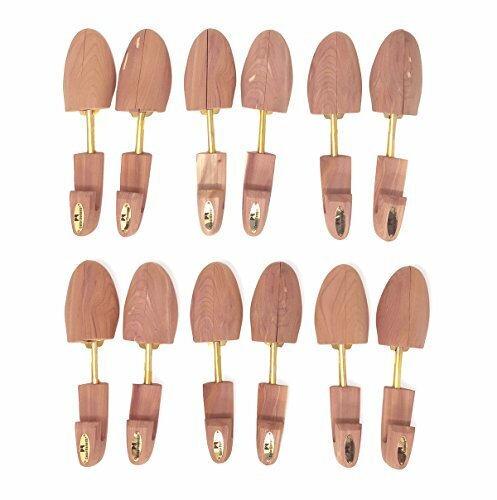 These shoe trees from Cedar Elements are not going to suit all shoes you own, but the success rate is relatively high. Therefore, they are worth taking the risk on when it means you get to benefit from high-quality shoe trees. When you buy these shoe trees, you get six pairs. You can then pick one of five sizes and immediately enjoy all the benefits they have to offer. They are well presented, have a beautiful cedar aroma, and feature red cedar construction so that you know they’re made to last. What’s more, they are going to suit a broad range of shoes – even if that doesn’t mean all footwear. They have an adjustable split toe to make them more compatible, a contoured heel, and a high vamp. The heel is a unique shape, but that may end up being a positive instead of a negative point. They are affordable, protect against insects and moths, and stop mildew and must in its tracks too. Sealing the deal is the beautiful wood grain that makes these stand out in a league of their own. 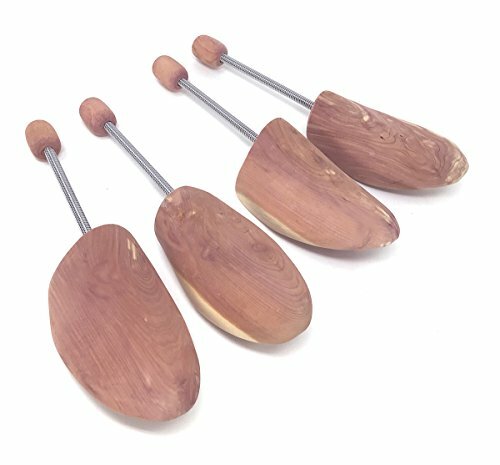 If you need new shoe trees, or you want a gift for a shoe-mad family member, check out these shoe trees from Cedar Elements. Aside from possibly not being true to size, and being hard to get out of your shoes, these cedar shoe trees from Stratton may be the very thing you need to care for your footwear properly. Instead of leaving them there to shrink, wrinkle, and smell, these shoe trees ensure they keep them in premium condition – even smelling beautiful too. They are ideal for men’s footwear, come from the United States, and feature red aromatic cedar which leaves a delicious odor in your shoes. They are an excellent option if you typically have stinky feet! You can also buy these shoe trees in six sizes, meaning you can get them for yourself and a loved one as a gift. Enjoy the moisture-absorbing properties, adjustable design, integrated spring coil, and the affordable price tag. Sealing the deal is the exceptional presentation, smooth finish, and ease of slotting into your shoes. These shoe trees are going to impress many people. Trying to find wooden shoe trees that don’t cost the earth seems almost impossible. Everywhere you look, you end up with high price tags that are out of your comfort zone. After all, why spend a fortune on shoe trees when you can spend that money on new shoes? Ollieroo is a game changer. 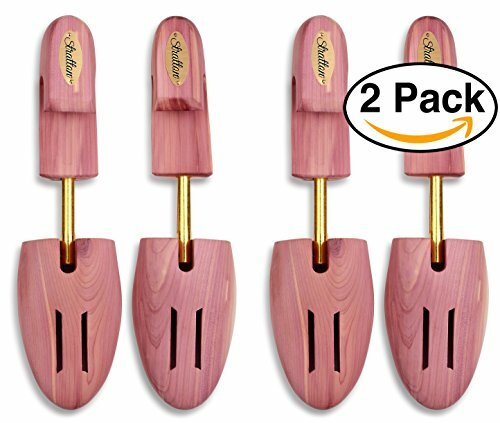 This supplier comes to the party with a twin set of cedar shoe trees in three size options. While the sizing isn’t all that accurate, you may like to compare it to the sizing chart and see if they will fit before you purchase them. The red cedar is well-presented and sanded well, while the dual brass-plated steel tubes add both class and function to these trees. The steel component is a durable and long-lasting zinc alloy. The adjustable design is also another standout point, helping to stretch your shoes without damaging them. However, they are a little bit too gentle, with the spring-loaded component not putting enough pressure on the shoe. 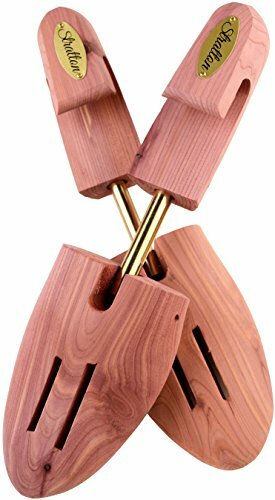 These shoe trees from Ollieroo are not the best option on the market, but given their affordable price tag and cedar construction, they may be the very set for which you’ve been searching. These shoe trees from Eachway are not the most durable on the market – nor do they always last a long time. However, they can be a saving grace if you have a pair of shoes that don’t quite fit, but you’re not ready to give them up. 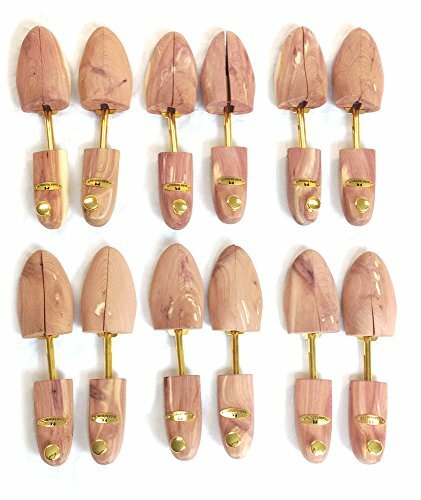 You can buy these shoe trees in five sizes in a pink color scheme, suitable for men and women. They feature robust polyurethane and steel, come with eight pressure relief pads, and an adjustable knob. The knob lets you change the length of the shoe trees, so it applies more pressure to your shoes. The pressure relief pads, on the other hand, are merely for helping you feel less pain as you adjust to your new shoes. The best way to use these shoe trees is by leaving them in your shoes for 1-2 days. You can then remove them and see if your feet fit better and with more room. If they don’t, put the shoe trees back in for further stretching. These shoe trees come in plenty of sizing options with an affordable price tag, and they are useful for making your shoes a bit roomier. The plastic components don’t offer a lot of confidence as they can break, but the convenience of these shoe trees far outweigh the risks of breakages. 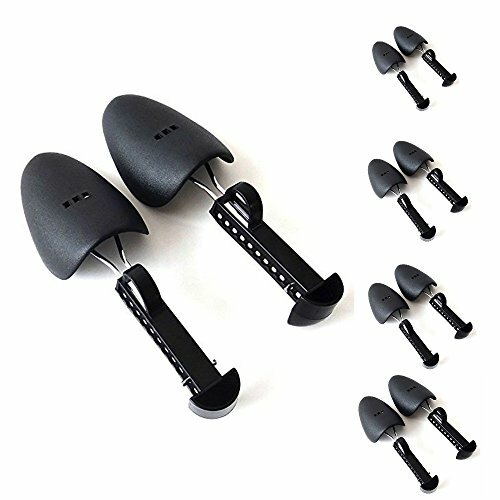 Even though you can only use these shoe trees in your sneakers, if you’re a sneaker collector, it’s the perfect accessory to own. Not only do they do the job well, but they are stylish and striking while they do it. You can buy them for an affordable price tag, get two sets, then immediately enjoy their style. They are black with a gold logo, have a velvet coating to protect the insides of your shoes, and have an adjustable rear too. The spring component is also a handy feature, meaning they are likely to fit more sneakers than you thought possible. Best of all, you get two pairs in one set – offering incredible value. Unlike wood shoe trees, these are lightweight, flexible, and are ideal for transportation. You may struggle with the spring in your luggage, but they fit far better than other brands. They are also contemporary, elegant, and you will enjoy how effectively they let your shoe hold their shape. They are easily some of the best sneaker shoe trees for sale. Even though you can’t adjust these shoe trees easily, and they are a “no frills” product when you compare them to others, that doesn’t mean they won’t be suitable for your needs. As long as you have European 43-44 sizing, they are bound to tick all the boxes for your requirements. It also doesn’t matter whether you have men’s or women’s shoes. 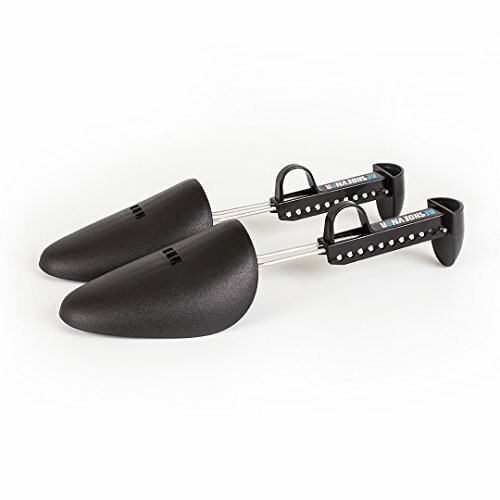 If you need to shape, stretch, or retain the shape of your footwear, then these shoe trees can help. They are of practical design, feature strong wood, and are affordable to buy too. What’s more, if you lack space for large, cumbersome shoe trees, then these fit the bill nicely. They are compact, straightforward to store, and lightweight too. They also have an adjustable spring design to offer a bit of movement. They are a basic shoe tree with no frills, but they are every bit as convenient as you need them to be for shoe shaping and stretching on a budget. You might not think you need to refer to a shoe tree buying guide before you get your wallet out, but it might be in your best interests. Some shoe trees can be quite expensive, and if you don’t buy the right ones, you’ll end up buying them twice – if not more. That’s why it could be worth reading the following information below. The price tag for new shoe trees can vary quite dramatically. Some cost more because they feature high-quality materials such as cedar, while others are available in bulk lots – making them expensive as a whole, but cheap by the unit. Before you buy a new set of shoe trees, identify what you want to do. Do you want more than one set, or several? By knowing the quantity, you have a better chance of choosing the most competitive unit rate relating to the quality of the product. Not every pair of shoe trees features the same materials. You often see this reflected in the price tag. Some are dirt cheap and feature plastic and steel, while others are expensive and come with wood. Most shoe trees made with wood are cedar. Cedar has a strong odor that can combat poor smelling shoes and moisture-wicking properties. However, they can be more expensive, heavier, and require more maintenance. Plastic, on the other hand, is lightweight and more affordable. In saying that, it can also break easily and becomes brittle as the years pass. Even though it’s generally partnered with steel, that’s often not enough to give it the strength to last the distance. The style is often either practical or practical and elegant. There is no in between. You can buy shoe trees that you can gift to people – such is the level of elegance. Or, you can buy pairs that you would happily hide away and not show anyone. Choose which is more important to you. The features for every pair of shoe trees can vary. Some have adjustment coils and hinges for expansion. They may also have hooks on the back for removing them from your shoes. Others are purely shaped like a shoe in wood, with a slight inset area at the end for you to remove them.